My photography is inspired by a lot of things: locations that blow me away, adventures I want to take, and most often, from seeing photos from other people that just make me say "I need to go there!" That's exactly the reaction I had when I saw David Thompsons photos from the bayou's of the southern United States. I had taken a short kayaking trip into the bayou swamps when I visited New Orleans a few years ago and David's photos were just the inspiration I needed to get back. Fortunately for me, David was kind enough to provide Willie and I with some guidance on getting back to the swamps. 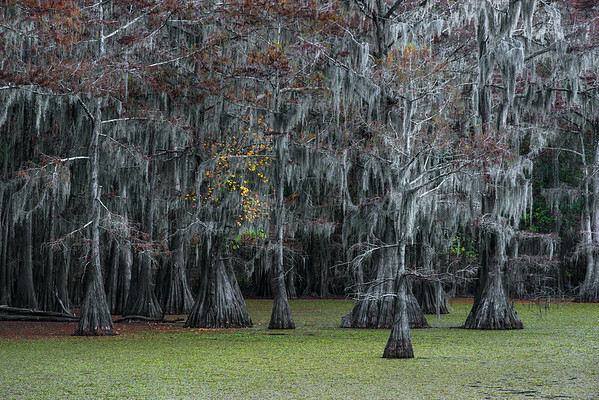 The thing that makes these swamps special, at least for me, was the amazing Cypress trees that line the swamps. These "Bald Cypress" trees are the only type of Cypress that loses its leaves, and it's why we visited the trees in the fall, when their leaves changed from green, to red, before falling off. This photo was taken on our second night, a few hours before David joined us. We were exploring a little lake that was filled with what we started calling "Ghost Trees". The leaves here had pretty much all died off and left the trees and the moss very white, or ghostly. However, while looking around, we spotted this one tree that still had some of its fall colors left.